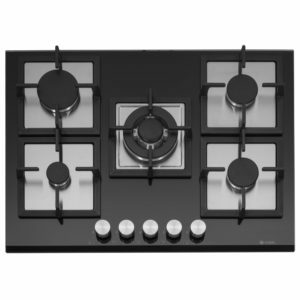 70cm wide, finished in black and with the characteristic design of Smeg's Victoria range of appliances, this fantastic 5 burner gas hob is a stunning addition to a kitchen. There's plenty of space and flexibility for cooking with, and with the useful ultra rapid burner, you have more power available for when you need it! 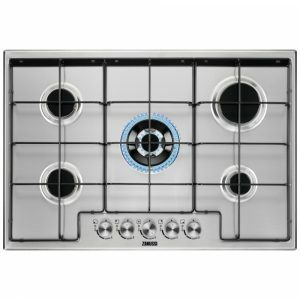 You will be able to cook up some great meals thanks to this superb 5 burner gas on glass hob. Finished in black glass with a gunmetal control panel and cast iron pan supports, it will sit perfectly in a modern kitchen. A flame failure safety device turns off the gas at the burner if the flame should go out, so you can have confidence as you cook. 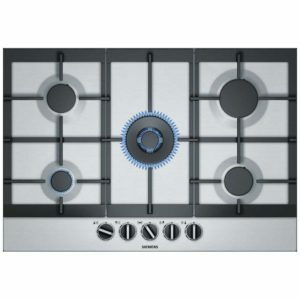 The Siemens EC7A5QB90 IQ-500 five burner gas hob is the perfect tool for the keen cook. With the new StepFlame controls and a powerful 4kW wok burner it will satisfy the needs of even the most demanding chef. This model is set up for use with natural gas but can also be used with LPG bottled gas using the alternative jets supplied. A flame failure safety device is fitted as standard. 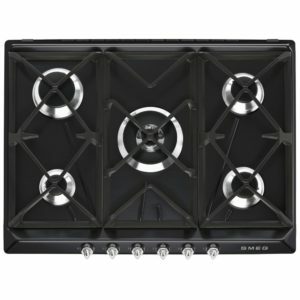 This superb 75cm wide gas hob from De Dietrich boasts five gas burners with cast iron pan supports. Finished in stainless steel it will look great in any kitchen. 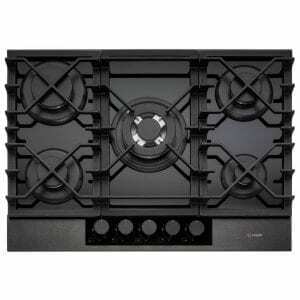 This stunning 75cm wide gas hob from Zanussi really makes an impact. 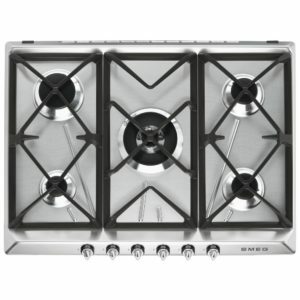 There are five gas burners with enamel pan supports for extra stability for larger pots and pans. The 4kw wok burner is designed to heat your pots and pans much faster than a generic burner, the double flame ring means more heat and less cooking time. Automatic ignition is easy to use at the press of a button, meaning no more manual lighting! An added safety feature is the flame failure safety device which detects when a flame has gone out, automatically shutting off the gas. 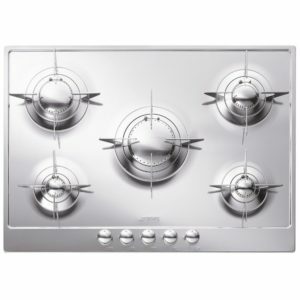 Finished in stylish stainless steel this Zanussi hob is beveled to retain spillages within the hob frame and reduce splatters and onto the work surface or the floor. It is sure to look great in any kitchen. This black glass gas hob really makes an impact. 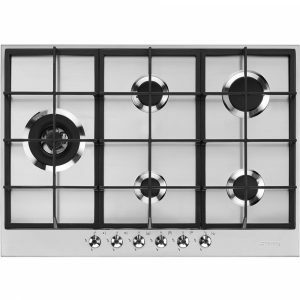 With clever design and a bevelled front edge, it will attract attention, while allowing you to cook up a great range of dishes thanks to the flexible and powerful gas burners. There are 5 burners with flame failure safety devices, which turn off the gas at the burner if the flame goes out, so you can cook without worry. 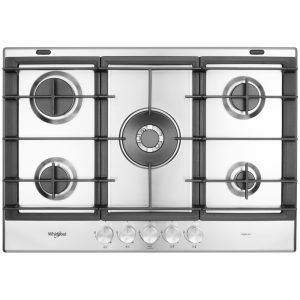 This superb 73cm wide gas hob from Whirlpool boasts five gas burners. Finished in stainless steel it will look great in any kitchen. 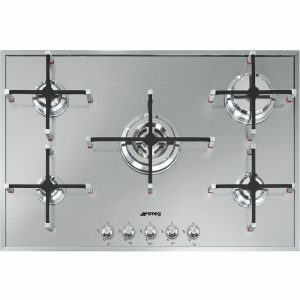 This 5 burner gas hob offers all the fine control and power of gas cooking, combined with the style and finish of Smeg's Victoria range of appliances. This model is finished in stainless steel for a fantastic modern twist on a traditional design. 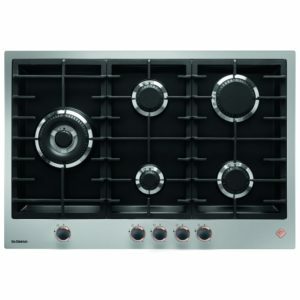 We love the distinctive style of this brilliant 5 burner gas hob from Siemens. The EP7A6QB90 not only looks fantastic in black glass but offers real cooking performance with Step Flame technology offering precise heat control. For when you need extra heat there's a powerful wok burner included. 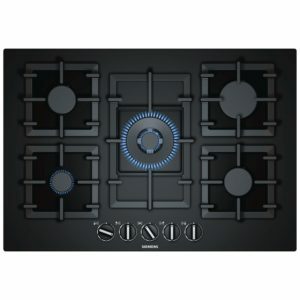 Easy to maintain, this hob will make a fantastic statement in your kitchen.